I was really interested in what records the city had of it’s own history and communities, especially in terms of imagery, and how those images told the story of the city. 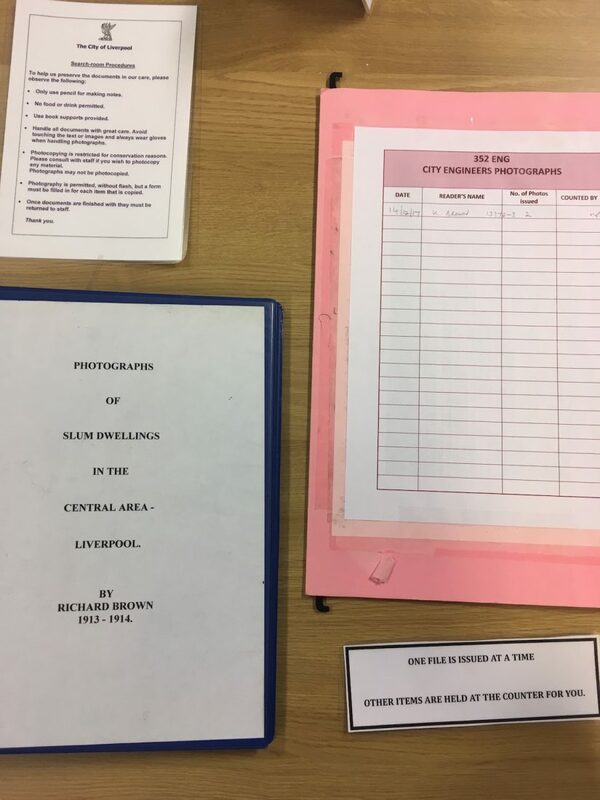 So, I spent a fair amount of time in the Liverpool Council archives, which are mainly held in the Central Library building. There are experienced archivists in the Library who can assist tracking down materials, but they charge £25 per hour to do so, and for such a broad based search if materials, the costs associated were going to be pretty overwhelming, so I was on my own! With 15km of archives, and an incomplete, and somewhat complicated searchable database, this quickly began to feel like a daunting task. 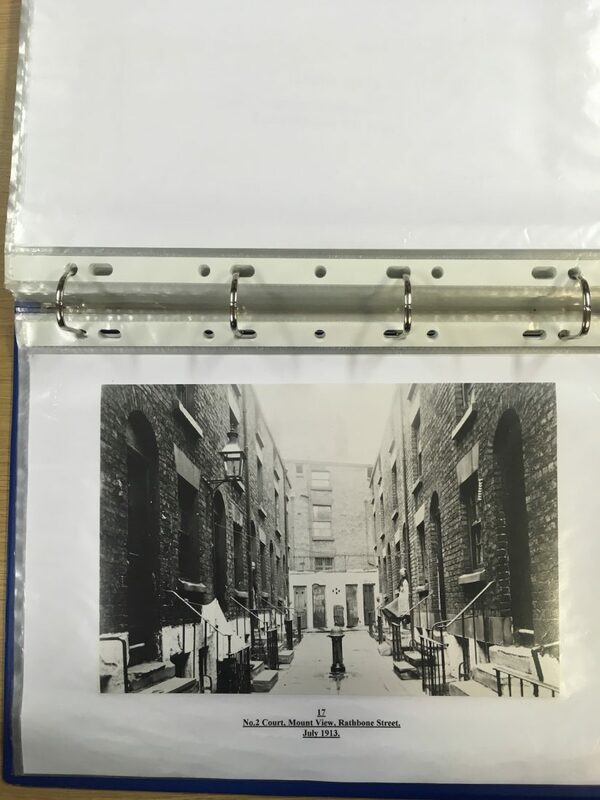 This archive includes content donated by individuals, as well as the usual council records of Births, Marriages and Deaths, Census Returns, Wills, and Street Directories of Liverpool from 1766 until 1970, much of these contained on microfilm and microfiche, and as far as anyone seems to know, some of these records have been put into the searchable database, and some not. Predictably, there’s a whole load of stuff that’s not directly relevant to the questions I’m asking, but are fascinating none the less. Most notably the archive contains the Letter Patent of King John, which established Liverpool in 1207. More useful to me, the records contain specific LGBT archives (including Sandi Hughes’s archive), Black History, Women’s History etc. Getting to grips with the database proved to be something of a nightmare. The archives website gave very promising sounding introductions to it’s collections, only for none of those collections to actually appear in the searchable database! This did mean that I got to spend a considerable amount of time in the pretty phenomenal old reading room that has thankfully escaped the bland refurb that the rest of Liverpool Library seems to have gone through. 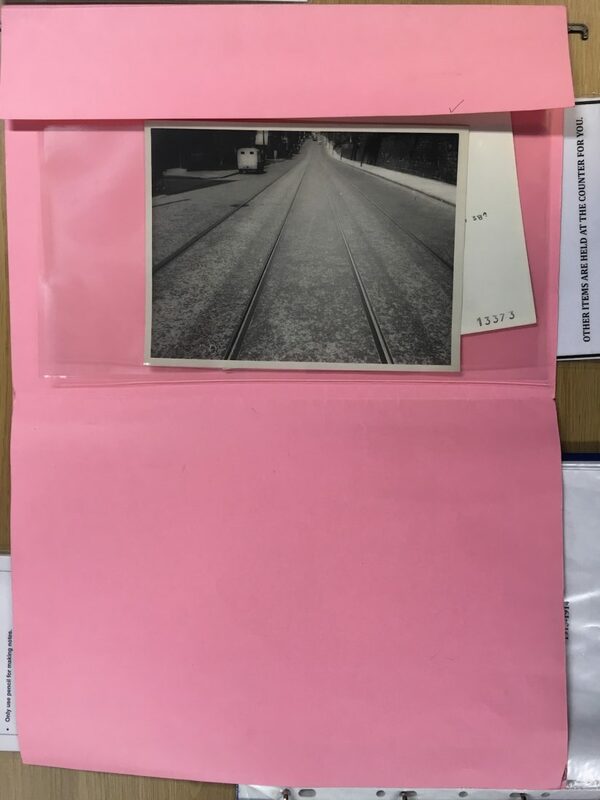 Aside from the frustrations of the search engine, the archive includes photo collections from local photographers (many of them amateur), The City Engineer’s Department of Liverpool Corporation (158,383 images dating from 1897 to 1995), and from this was separated out the The Housing Department’s collection of something like 12,000 photographs (which runs from the 19th century until the 1960’s). The idea of these vast collections of images, not shot for their aesthetic value, but instead as part of a municipal process are really fascinating to me. After much consternation, it turns out the housing photo collections isn’t listed in a searchable database. The more general engineering department ones are, but to find them, you have to put in individual street names, and see if any listing comes up. For the Housing departments collection there’s a series of folders that you have to look through. You start by looking up the street in this this section, Then cross reference that listing to see when the photo of that street was taken, and what it contains. Then you make a note of the indexed reference code (without having been able to actually see the image of course, and put in a formal request to view the image, which takes 48 hours). Also connected to photo archives, Bob Edwards; a local historian and writer maintains a site of old images of Liverpool. Some of these seem to come from the Liverpool Council Archives, although I can’t figure out which of the collections they are drawn from, or for that matter how he has navigated the necessary copyright to get them digitised and onto his site. – How long the decline in Liverpool has being going on for. 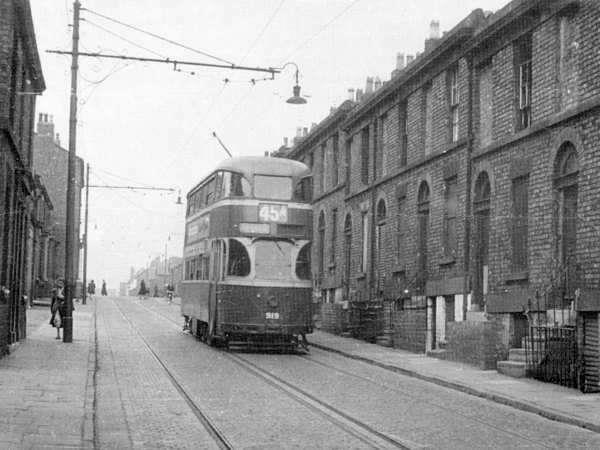 It was brought up several times in conversations that the decline in Liverpool set in from the 1930’s onwards. Obviously as a trading city, the decline in Liverpool charted the decline in the British Empire, but from my perspective Liverpool’s fortunes were so tied to Thatcher and the 1980’s, it was really revealing to see images from the 1960’s and 70’s where buildings are already starting to look decidedly run down, and that the depopulation has obviously already started in the pictures in the 1960’s as evidenced by the abandoned buildings. Liverpool population was 846,101 in 1931, dropping to 435,500 in 2001. The complication of that conclusion of course, is the ongoing process of slum clearance, and therefore not being able to be certain which of the empty buildings were abandoned, and which were a result of compulsory purchase orders by the council. – The obviously poor build quality of some of the houses that have since been demolished. There was a lot of controversy about the clearance of Georgian and Victorian housing stock, with arguably great buildings levelled with either nothing or really badly planned, generic buildings replacing them. However, in one of the conversations I had, the idea was brought up that the buildings that were levelled were badly constructed and in really bad condition. some of the images from L8 appear to back this up at least to some extent. A lot of these houses were built in a massive hurry during the boom years of Liverpool, and in the example below, the subsidence is obvious from the jaunty angles of things like window ledges and door frames in many of the images. I also got them to dig out some other images from the archive. Many of these were taken by independent photographers, and have ended being donated to Liverpool councils record office at various points over the years. Unavoidably, and repeatedly, the most striking thing about walking through the hinterlands of Liverpool City Centre, in neighbourhoods Toxteth is the incredible housing stock, the variable condition a lot if it is in, and the amount of unpopulated, derelict, boarded up or already demolished buildings. 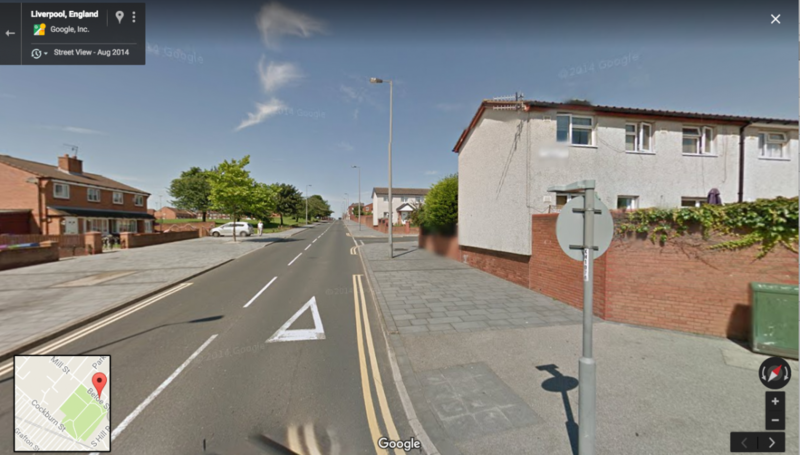 I’ve mentioned this earlier in this blog, but spending a lot of time wandering around these neighbourhoods in Liverpool, my thoughts keep coming back to them in different contexts. These images go straight back to that, documenting as they do much of the compulsory purchased property, and therefore houses that went on to be demolished. These images, and the housing that they document seems therefore to tell the story of the city, from the boom years of the empire to the post war decline.